There were plenty of questions for the England management to ponder at the end of a mixed and turbulent summer, not least how a team can be so dominant in a five-Test series only to completely lose form in one-day matches. After an impressive and deserved return to form following their Test series victory against India, England saw themselves thoroughly outplayed by the same opponents when it came to the shorter formats of the game. With much of the focus now on next year's World Cup, England's dismal run of ODI form has seen many punters write off their chances of being genuine contenders andeven lay them with Betfair for the contest in Australia and New Zealand early next year. To understand England's one-day troubles doesn't take too much investigation. England cricket's focus has always been on Test cricket - even more so over the past decade - and the one-day game has long be seen as a tool to blood future Test players and satisfy their television paymasters. The England one-day squad has often resembled more of an England Lions development squad than an international line-up, with young players given the chance to prove they can handle international cricket before being called-up to the Test team. While that might be a decent system in terms of bringing through talent for the Test side, it hasn't appeared to have had any noticeable benefit to either the 50-over or Twenty20 teams. While it has become custom for international teams to have a different captains for the Test and ODI sides, England have often shunned that in order to keep their Test skipper as their ODI captain. Using the theory that international cricket players can adapt to whatever format they're playing, England's ODI side has often looked a lot like the Test team. While there is a significant difference between Test and one-day cricket, there hasn't been a significant difference between the two for England players and supporters. From the limitations on bowlers, the fielding restrictions and the shorter boundaries, ODI cricket is a completely different entity to Test cricket, and it's essential for teams to approach it as such, rather than attempting to simply play a shortened version of the five-day game. While a score of 230 was a decent total a few years ago, an average 50-over score is now 275, with almost 50 scores of 300 or over in the last two years. With batsmen now attempting all sorts of shots in order to get the ball to the rope, bowlers and captains have had to forget almost everything they know from the five-day game in terms of tactics. While 50-over cricket is very different from Twenty20 cricket, teams generally play ODI's with more of a T20 attitude than one of a Test side. Yet the evidence from the ODI series humbling to India proves that England continue to play it like a Test match. Despite the fielding restrictions at the start of an innings, England's batsmen continue to leave balls and look for singles rather than take the game to the opposition. While India's top order pulled, hooked, drove and generally smashed everything England's bowlers had to throw at them, the hosts often found themselves chasing the game from the very first over, and fans responded by backing India to win. From England's recent ODI team, only Jos Buttler and Eoin Morgan have built strike rates of over 80, the only two English batsmen to make it in the list of 100 fastest scoring ODI batsmen. Rather than opt for batsmen who specialise in getting the ball to the boundary, England have continued with the likes of Cook and Ian Bell despite neither batsman scoring anywhere near the runs needed to help a team win a World Cup. And even when England's batsmen do manage to score 40+, they often do it at a rate that makes it almost makes the whole exercise worthless. While there's no doubt there are English players capable of being real successes in the world of one-day cricket, it doesn't look as though the selectors are going to ever make the dramatic changes that are probably needed to solve the problems in England's ODI cricket. Alastair Cook has since defended the side’s approach, but this – in many fans eyes at least – will only add to the mounting pressure on the captain’s back. The main change a lot of England fans and cricketing media have been calling for in recent weeks is for Alastair Cook to step down as ODI captain. 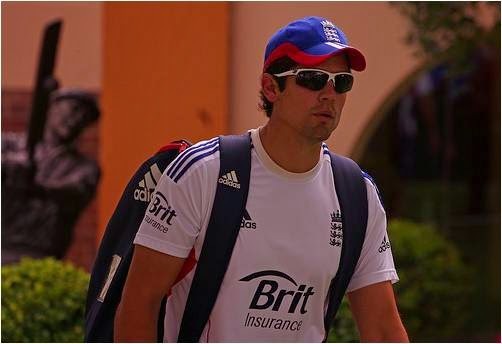 After coming through a stressful summer in which his Test captaincy came under huge scrutiny, Cook managed to hang onto his job after leading the team to a Test series win against the Indians. The ODI series against India made it painfully clear that Cook and England needed to address things before next year's tournament, not only for his lack of runs at the top of the order but also for his conservative captaincy, but it looks as though the selectors are going to stick with the batsman despite calls for Eoin Morgan to replace him. The question will be whether Cook can now prove a lot of people wrong and lead England to only their second major tournament victory. If he can't, however, it would be hard to see just how he could continue in the job.